On a hillside overlooking the picturesque Geirangerfjord, surrounded by majestic mountain peaks, you will find the luxury boutique development Grande Fjord Hotel. Here, in the south-west of Norway, you can relax and unwind, while taking advantage of everything this cosy hotel has to offer. Having undergone a total renovation in 2017, the hotel now consists of 46 rooms, and each is a fusion of traditional Nordic design and modern comfort. 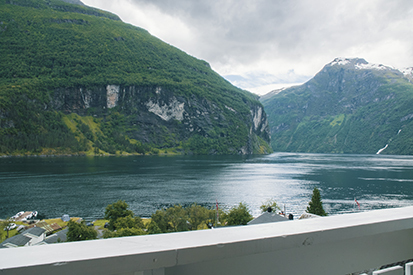 Fjord-view rooms offer spectacular views over the stunning fjord and surrounding mountains, while standard rooms are slightly cheaper, with either a limited view or no balcony. “We do pride ourselves on making sure all of our guests get to experience what they come here to see – the view of the fjord,” Grande smiles. While the interior has a more contemporary yet homely look, with darker wood features and fireplace, the exterior is typically Norwegian, with characteristic white wood. “We are very orientated towards the local area and wanted to create a cosy, ornate boutique hotel, which reflects the traditional local style, a bit like a modern cabin,” says Grande. In fact, most of the furniture is designed in-house and produced by a local furniture and interior manufacturer called Slettvoll. A new fitness room, lounge and Jacuzzi have also recently been added to the establishment, while the bar and lounge area is open every evening and is beautifully situated on the sixth floor. Here, guests can enjoy the view from either inside or outside on the terrace, while sipping on a delicious drink. “We offer different kinds of local beers and wines from all over the world, as well as craft cocktails and homemade liquors made by our master barman,” Grande adds. On the top floor, you can also taste excellent Nordic cuisine at the hotel’s own restaurant Hyskje – a brand-new kitchen, which offers modern Scandinavian-style gastronomy. Focusing on local, high quality ingredients, the restaurant has quickly become popular. “Almost everything here is made from scratch with passion, from local produce from the area around Geiranger. Meat from Ole Ringdal in Hellesylt, salmon from Slogen, cod from the coast around Ålesund, and potatoes and vegetables from local farms are just a few of the things we proudly offer,” says Grande. Open for breakfast, lunch and dinner, with an à la carte menu and impressive buffet, Hyskje is an idyllic place to dine while taking in the spectacular panoramic view.